From fishing and game viewing to boating or cultural activities, this town on the touristic Treasure Route has more to offer than just vast fields and agriculture. Bloemhof Nature Reserve is well worth a visit. View game like Rhino, Giraffe or the rare Waterfowl in this conservation area or take part in international angling contests. The Vaal River feeds the Bloemhof dam, one of the largest ones in South Africa, which is famous for water sports and very popular during summer. The Southern Region of the North West Province unfolds along the course of the Vaal River which marks the border of Gauteng in the west and the Free State Province in the south. This route passes along beautiful yellow and green patchwork maize and sunflower fields which alternate with bushveld where wild olive and umbrella thorn trees can be seen. In this region, visitors can enjoy hiking, biking, white water rafting and mountain climbing and angling along the Vaal. Bloemhof Dam Nature Reserve is located on the N12 Treasure Route 300km (186 miles) south west of Johannesburg and 150km (93 miles) north east of Kimberley. The dam is one of the largest in the country, with an area of 25 000 hectares and is fed by the Vaal River. The dam wall which is accessed from Bloemhof village gives a great view of the dam especially when the river is in full flood. Bloemhof Dam is a premier angling destination in South Africa and located just outside this town in the North West Province. It is hosting major competitions for both local and international anglers such as the Tri-Nations and the Bloemhof Bonanza. The Bloemhof Nature Reserve is 4km (2.5 miles) out of this town, in the direction of Hoopstad. Roads within the reserve are suitable for most vehicles with some exceptions in very wet conditions. The dam is open to all water sports with Powerboat launching facilities provided; this is a favourite area during the summer. The 12 000 hectare conservancy is home to a wide variety of plains game including Black Wildebeest, large herds of Springbok and also Eland and Gemsbok. 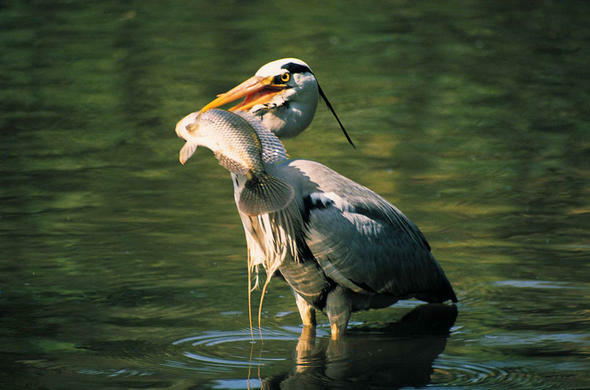 This reserve near Bloemhof town in the North West Province also has over 250 species of birds and some rare waterfowl. The reserve and dam together give the Bloemhof visitors a great combination of game viewing and fishing in a top freshwater angling site in the country. The climate here is generally mild to hot with some cold nights during the winter. On the Free State Province side of the Bloemhof Dam is the Sandveld Nature Reserve boasting a variety of wildlife including Rhino, Buffalo, Giraffe, Wildebeest, also Eland, Sable and other antelope species.